The story of the Prentiss brothers of the Civil War is one of the most fascinating tales of that event. It has it all: brothers from a border state, with different loyalties, one going north to fight to preserve the Union, one going south to fight for the Confederacy. Then, after fighting for their cause for several years, and with the Civil War about to dramatically end just a week later, they would both be mortally wounded within feet of each other, one leading his regiment in the attack on Confederate fortifications, the other defending those same fortifications. 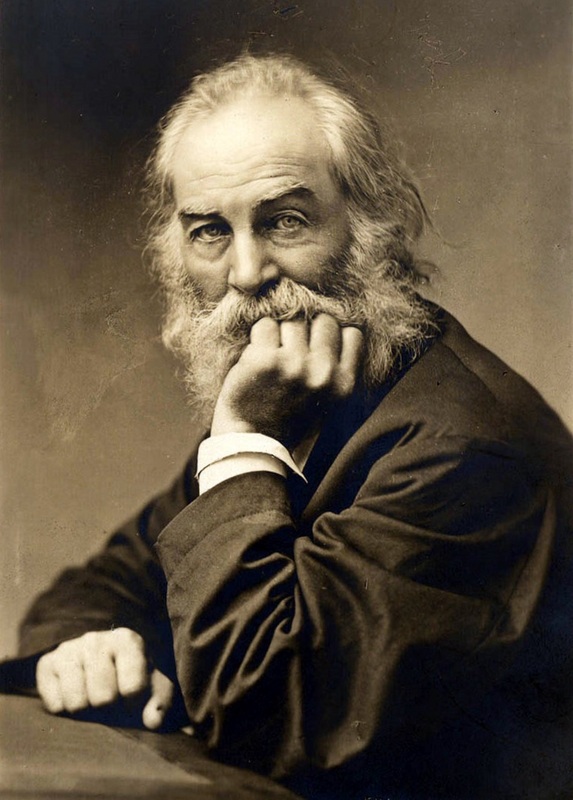 Their volunteer nurse, none other than poet Walt Whitman, was so moved by their story that he would write poignantly of them. And this is a story that has continued to develop, at Green-Wood, over the last few years. 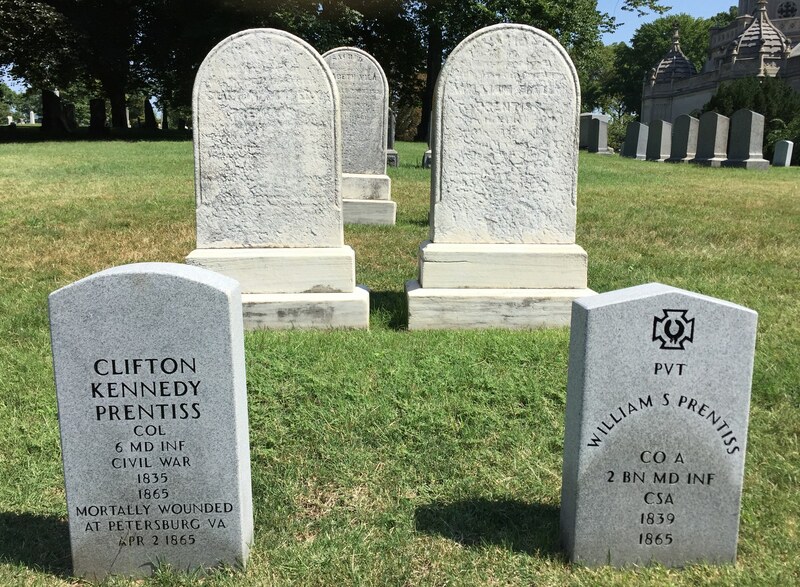 Brothers Clifton Kennedy Prentiss and William Scollay Prentiss were born, respectively, in 1835 and 1839, near Baltimore, Maryland. Clifton Kennedy Prentiss. No photograph of his brother William is known. Click on images to enlarge them. On April 12, 1861, Fort Sumter was attacked by rebel forces and the Civil War began. The next day, President Abraham Lincoln issued a call for troops to rush to Washington, D.C., to defend the nation’s capital. 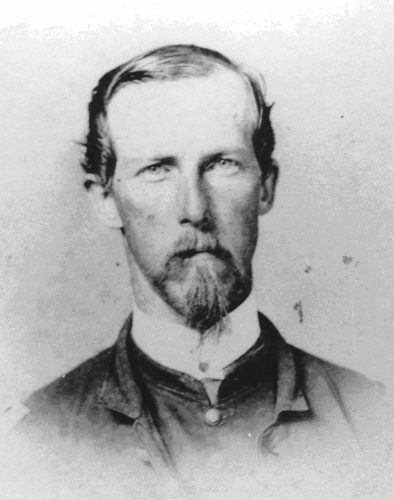 Only two days later, Clifton Prentiss, responding to the call, enlisted in the 7th New York State Militia, serving 30 days with that famed regiment before it mustered out. On March 30, 1862, Clifton enlisted in the 5th Maryland Infantry (Union), then transferred to the Sixth Maryland Infantry as a second lieutenant on July 31, 1862. 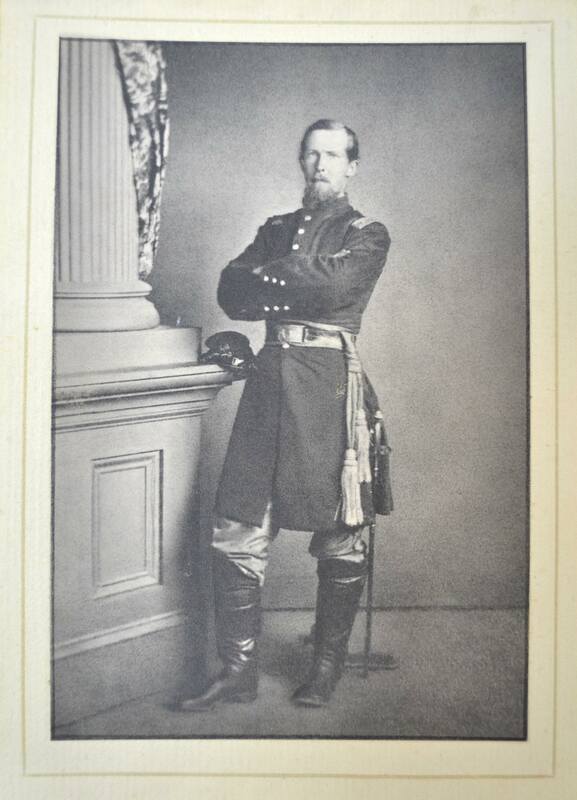 As the Civil War dragged on, Clifton rose through the ranks, promoted to captain (Chief of Pioneers), then major, and ultimately posthumously breveted lieutenant colonel and colonel. His younger brother, William Scollay Prentiss, chose a different path. In March of 1862, William, like his brother unmarried and living near Baltimore, cast his lot with the South, enlisting as a private in Company D of the First Maryland Infantry, Confederate. On August 27, 1862, he transferred to Company A of the Second Maryland Infantry. Clifton Kennedy Prentiss. Courtesy of the Historical Society of Cecil County Historical, Maryland. Though, in the ensuing years, Clifton and William heard occasional rumors that the other’s regiment was camped nearby, they did not meet again until April 2, 1865. It was on that date that Lieutenant General Ulysses S. Grant, general-in-chief of all Union forces, ordered an all-out assault along his entire line on the Confederate forces under General-in-Chief Robert E. Lee that had been dug in south of Petersburg, Virginia, for almost a year. 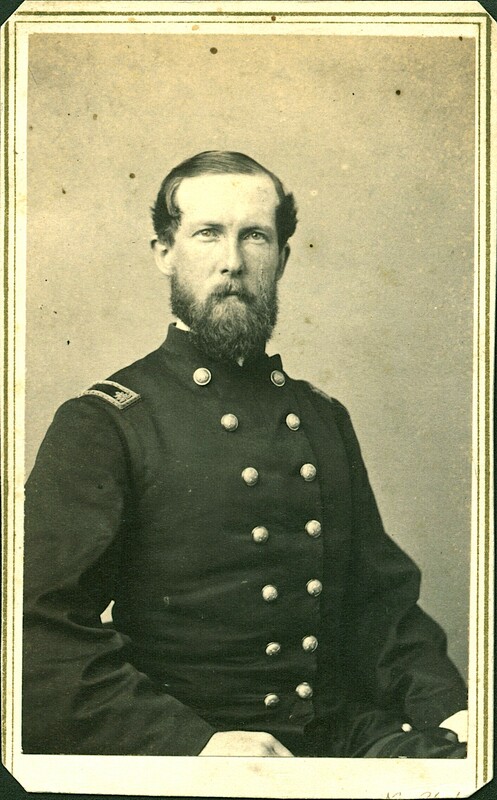 According to the report of the field correspondent for the New York Herald, Major Clifton Prentiss led the dawn attack of the 6th Maryland; he was the first officer to enter the enemy’s defensive works that were in his regiment’s front. Major Clifton Kennedy Prentiss, in a carte de visite photograph. It was taken by a New York City photographer–see the top of “New York” at right bottom. The Green-Wood Historic Fund Collections. This bronze was installed a few years ago at Pamplin Park, which now owns the fortifications that Clifton and his regiment attacked and which William defended. 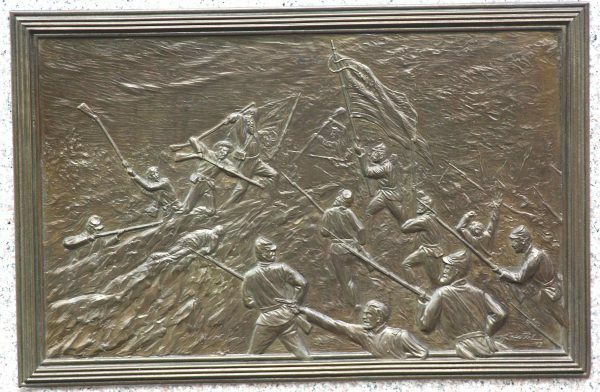 The Union soldiers are at right, attacking behind the color bearer carrying the United States flag. The fortifications and the Confederates are at left. 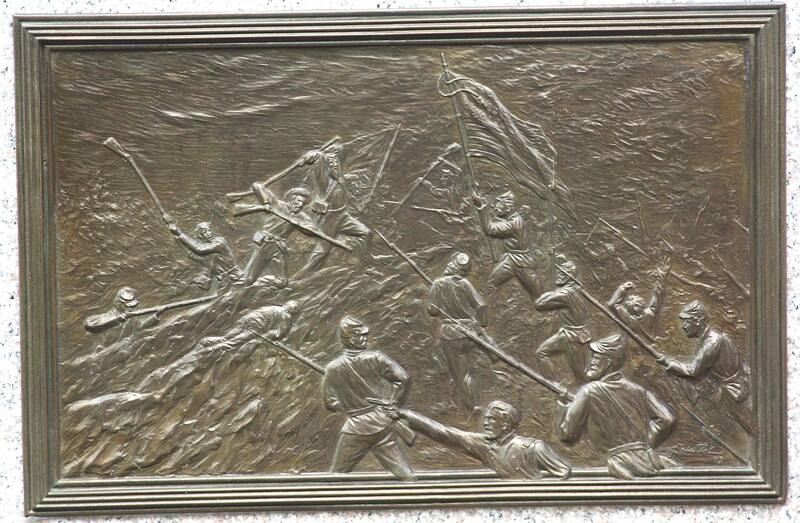 Near this bronze is a sign telling the story of the Prentiss brothers. Maj. Clifton K. Prentiss, a Baltimorean, was a man of exceptional bravery, a veritable cavalier. On this fateful morning he fell mortally wounded, as with waving sword he urged forward his men, to be the first to mount, with assistance, the enemy’s works. Col[onel] Hill, after giving directions to have the wounded Confederate brought over, knelt down beside the Major and pleaded with him to see his brother. When the wayward brother was laid beside him our Major for a moment glared at him. The Confederate brother smiled; that was the one touch of nature; out went both hands and with tears streaming down their cheeks these two brothers, who had met on many bloody fields on opposite sides for three years, were once more brought together. 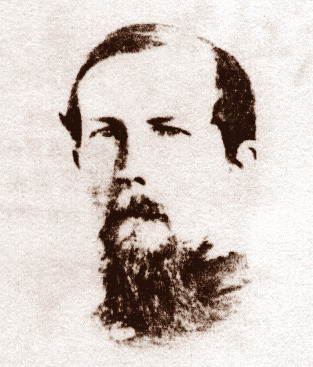 Major Clifton K. Prentiss commanding the Sixth Maryland Volunteers, was one of the first officers to enter the rebel works, but was unfortunately shot through the chest . . . we picked up a wounded rebel, who said he was Lieutenant Prentiss, of the Second Maryland rebel regiment. He is a younger brother of the Major whom he has not seen since the rebellion broke out. William Howell Reed, in Hospital Life in the Army of the Potomac, reported on what had become of the wounded Prentiss brothers soon after the battle: “They are now lying in the same tent in the Fiftieth New York Engineer’s camp, and I am glad to say likely to do well.” But, sadly, that was not to be. 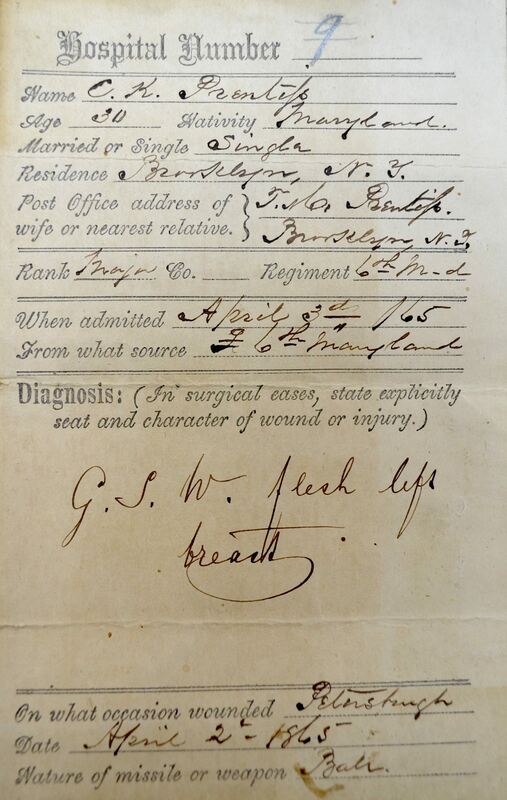 Both Clifton and William Prentiss had been taken to a Union field hospital near Petersburg. While William was held there as a prisoner of war, his shattered right leg was amputated, consistent with medical practice of the time. On May 14, both brothers were transferred to Armory Square Hospital in Washington, D.C., for further treatment. Armory Square Hospital, where the Prentiss brothers were treated. 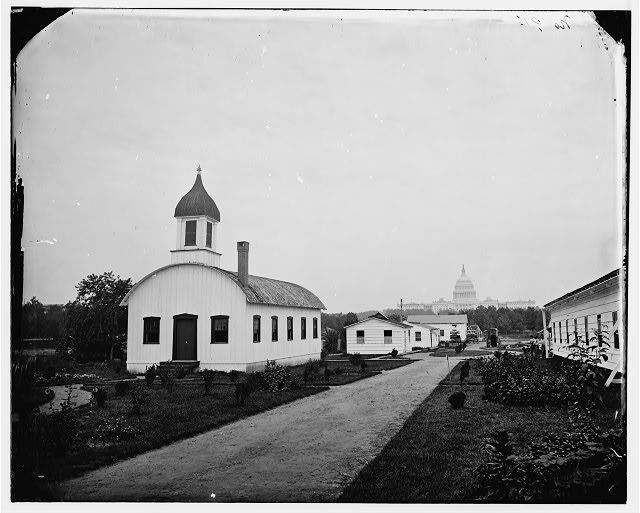 It was located where the Smithsonian’s Air and Space Museum now stands. Note the United States Capitol in the distance. Courtesy of the Library of Congress. 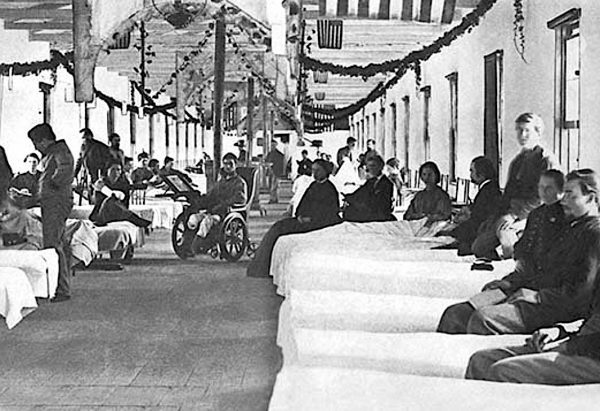 The sick and wounded inside a ward at Armory Square Hospital, late in the Civil War. Both Union and Confederate soldiers, sick and wounded, were treated there. At Armory Square Hospital, a man who described himself as an “Army Hospital Visitor” was waiting. His name was Walt Whitman, destined to become America’s greatest poet. Nurse, and poet Walt Whitman, who wrote tenderly about the Prentiss brothers. May 28-9. — I staid to-night a long time by the bedside of a new patient, a young Baltimorean, aged about 19 years, W. S. P., (2d Maryland, southern,) very feeble, right leg amputated, can’t sleep hardly at all — has taken a great deal of morphine, which, as usual, is costing more than it comes to. Evidently very intelligent and well bred — very affectionate — held on to my hand, and put it by his face, not willing to let me leave. As I was lingering, soothing him in his pain, he says to me suddenly, “I hardly think you know who I am — I don’t wish to impose upon you — I am a rebel soldier.” I said I did not know that, but it made no difference. Visiting him daily for about two weeks after that, while he lived, (death had mark’d him, and he was quite alone,) I loved him much, always kiss’d him, and he did me. 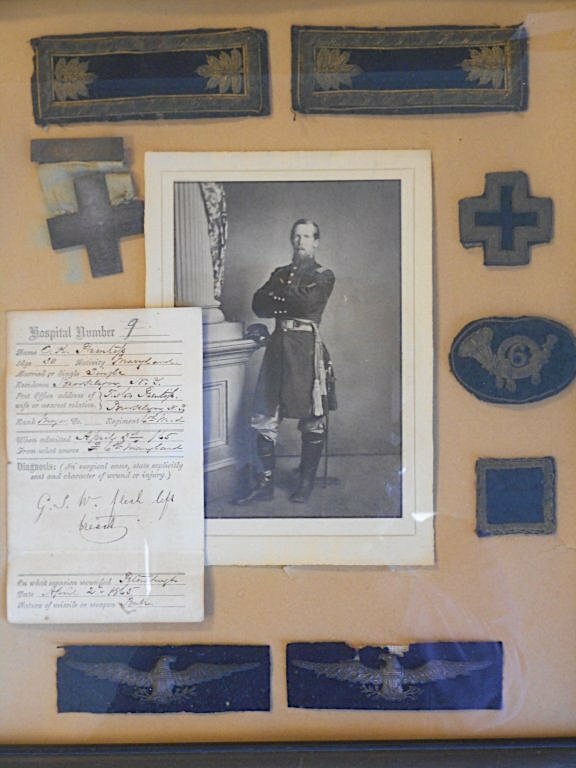 In an adjoining ward I found his brother, an officer of rank, a Union soldier, a brave and religious man, (Col. Clifton K. Prentiss, sixth Maryland infantry, Sixth corps, wounded in one of the engagements at Petersburg, April 2 — linger’d, suffer’d much, died in Brooklyn, Aug. 20, ’65.) It was in the same battle both were hit. One was a strong Unionist, the other Secesh; both fought on their respective sides, both badly wounded, and both brought together here after a separation of four years. Each died for his cause. William died at Armory Square Hospital on June 24, 1865, and his remains soon were interred at Green-Wood Cemetery in section 84, lot 6007, near Valley Water. Clifton, holding out hope for his own recuperation, was discharged in August to a relative’s home at 35 Livingston Street in Brooklyn. But he died there on August 18, less than two months after his brother had succumbed. Clifton soon was buried next to his brother William, and they have lain side by side for 153 years. The extraordinary story of the Prentiss brothers has been developing at Green-Wood for years now. Green-Wood launched its Civil War Project in 2002–an effort to find as many as possible of the Civil War veterans who are interred at the cemetery. Early on, we guessed that we might find 500 such men; as of this writing, we have identified 5,200! Some we have found through painstaking research–for example, volunteers have gone through the 162,000 names of those who enlisted in New York City or Brooklyn, comparing those names online to Green-Wood’s database of those interred at the cemetery. But, as word spread about our unprecedented Civil War Project, we also heard from many descendants who knew the stories of their ancestor’s service and that they were interred at Green-Wood. One such descendant, who lives in Arizona, contacted me about 2005, sharing the story of, and research about, the Prentiss brothers. Without that help, we might have not found them at Green-Wood–their marble gravestones had become unreadable and therefore provided no clue. 2008 marked another year in the story of the Prentiss brothers at Green-Wood. David H. Jones is an historical researcher and writer. He became fascinated by the story of the Prentiss brothers. His book, Two Brothers–One North, One South, published in 2008, tells their story based on new–and extensive–research. David H. Jones is the author of Two Brothers–One North, One South, a fictionalized account of the Prentiss brothers. 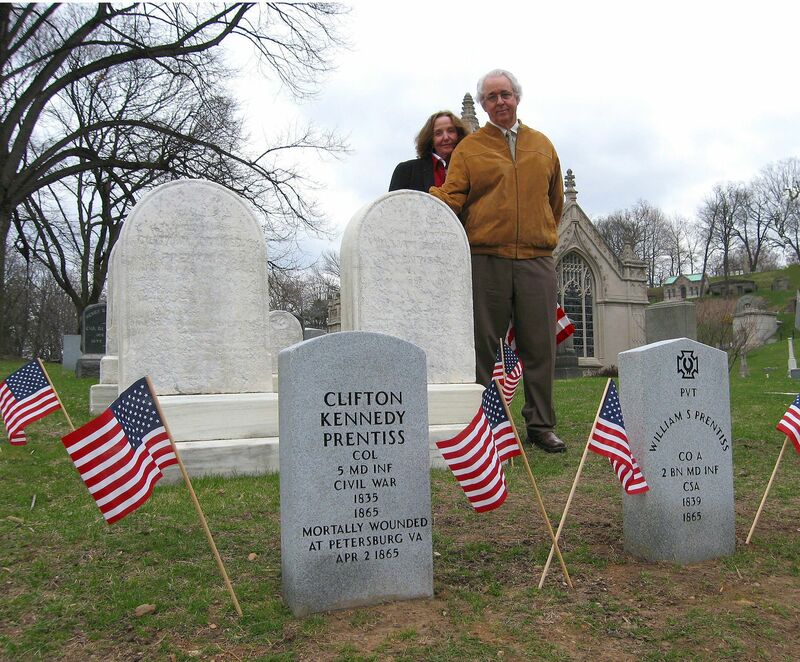 In 2008, David and his wife, Dian, unveiled the VA gravestones that volunteers with Green-Wood’s Civil War Project had obtained for Clifton and William. Note that Clifton’s new gravestone here–gray granite–specifies his service in the 5th Maryland. This stone has since been replaced with one featuring his service in the 6th Maryland–the regiment that he led in the April 2 attack, when he was mortally wounded. The original white marble gravestone for Clifton is at back left; that for William is at right rear, next to David. The graves of Clifton and William, with Clifton’s Department of Veterans Affairs gravestone replaced to reflect his service in the 6th Maryland, the regiment that he led in his final–and ultimately fatal–charge. The donation. Note the uniform badges. The one with the 6 on it, at right middle, represents the 6th Maryland Infantry. The major bars that appear at the top are likely those that appear in the carte de visite photograph above. 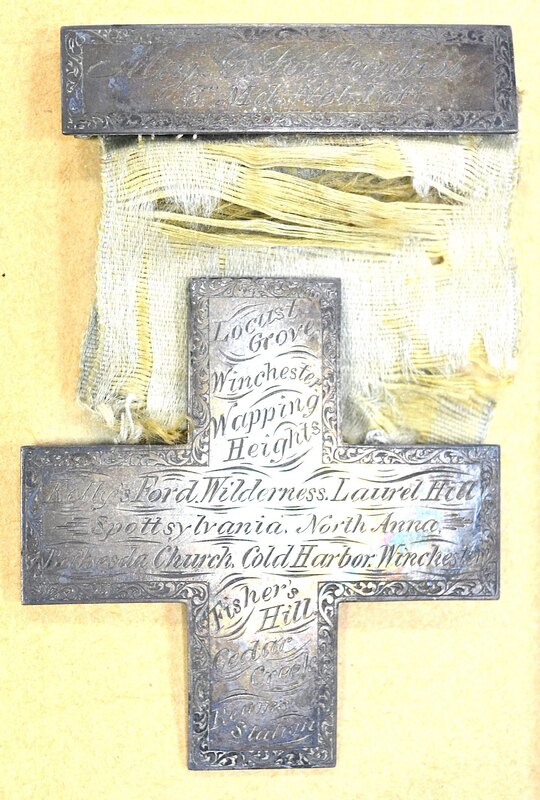 This custom item, in the shape of the cross symbolic of the Sixth Corps of the Army of the Potomac, to which the 6th Maryland Infantry was assigned, is inscribed with the names of the many battles that Clifton Kennedy Prentiss fought in. Note that the fabric ribbon, a century and a half old, connecting the two metal pieces, is coming apart. The metal bar at the top of the medal, above the ribbon, identifies it as the property of Major C.K. Prentiss of the 6th Maryland Volunteer Infantry. Photograph of Major Clifton Kennedy Prentiss, in his finest, with officer’s sash, sword, kepi (hat) and boots. This hospital form records Clifton Kennedy Prentiss’s residence as Brooklyn, New York. 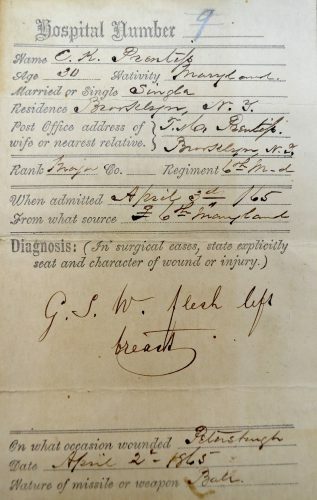 “G.S.W.” is for gunshot wound; its records that injury to the flesh of his left breast. The Prentiss brothers’ story is an extraordinary one. Green-Wood is proud to tell it–and to share these donated items online. Clifton Kennedy Prentiss, David Jones, Stacy Locke, Walt Whitman, William Scollay Prentiss.